Rick Timbs, executive director of Statewide School Finance Consortium, emphasizes that state aid to school districts is underfunded and unequally allocated as he addresses rally at Kenmore East l Thursday. See a photo gallery at BuffaloNews.com. State aid to school districts is woefully underfunded and is distributed unequally. That was the cry Thursday at a rally – spearheaded by the Erie County Association of School Boards and other local education groups – aimed at sounding the warning on the impact that cuts to education funding will have. In an unusual move, superintendents and School Board members from more than 30 districts rallied Thursday night in Kenmore East High School to draw attention to what they describe as deep cuts to basic state aid used to run schools in the last four years. During an hourlong presentation occasionally punctuated by applause, Timbs used a bevy of statistics and anecdotes to drive home his point that state aid reductions from a tool known as the “gap elimination adjustment” have had a devastating effect on poor and average-wealth districts. Overall, he said, schools across the state have been shortchanged by nearly $8.5 billion since the funding change was put in place four years ago to address a state budget gap. Districts have responded by cutting staff and programs and using up their fund balance. Timbs presented data to show that the state’s education aid formula is flawed and results in huge disparities between poor and wealthy districts. 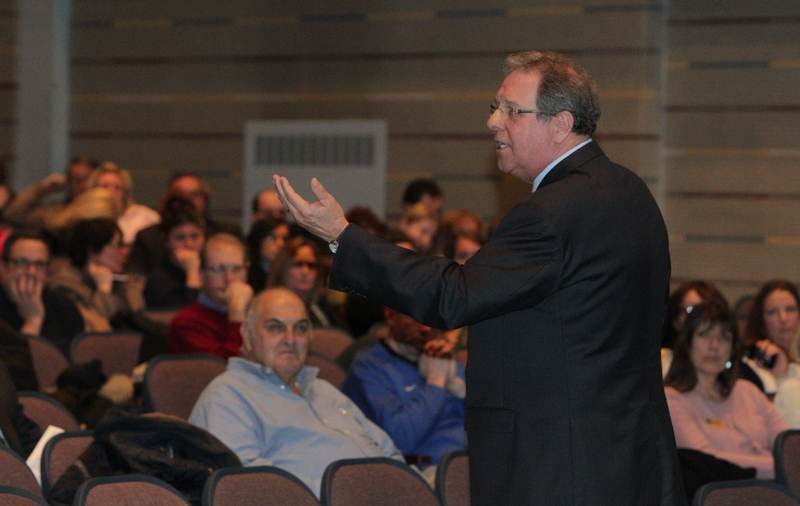 And Western New York is the epicenter of districts that have been hit the hardest, he said. The meeting was the first time school officials, teachers and other educators came together at a public rally to draw attention to the lost state aid. In addition to the Erie County Association of School Boards, the rally was organized by the Western New York Educational Service Council, the Western Region PTA, Erie-Niagara School Superintendents Association and Campus Construction Management. A handful of local state legislators also attended the rally, and some have sponsored or co-sponsored legislation that would pay down or repeal the state aid adjustment. While Gov. Andrew M. Cuomo’s budget proposal for next year would actually increase state aid to schools, it’s not enough to make up for the previous cuts. Timbs issued a call for action and encouraged the approximately 300 concerned parents, district residents, community leaders, school staff, administrators and School Board members in attendance to start a movement in time for debate on this spring’s state and school budgets.